Low-cost PC maker eMachines has introduced its new EL1300G Series of compact desktop PCs, with two models available now starting at $298. Both feature a more modern glossy-white finish, silver trim, and glowing green LEDs. 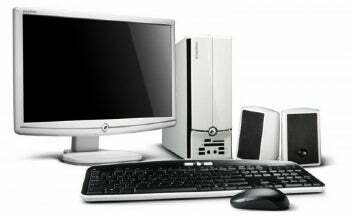 The $298 EL1300G-01w includes a 1.6GHz AMD Athlon 2650e processor, 2GB of memory, a 160GB hard drive, Nvidia GeForce 6150SE integrated graphics, a DVD writer and Windows Vista Home Basic. No monitor is bundled, but an 18.5-inch (1366 by 768 resolution) eMachines E182H wm monitor, in matching white, is available separately for $119. Though the $398 EL1300G-02w has similar specs, it ships with a bundled 20-inch widescreen LCD, and has just 1GB of RAM to power its Windows XP Home installation. AMD has its eyes on Intel's Atom processor with the 2650e, so it'll be interesting to see how the EL1300G series performs against similarly priced Atom-powered compact PCs, such as the $320 MSI Wind Nettop and $350 Asus Eee Box (click through for full reviews). For those not keeping count, eMachines was bought by Gateway in 2004, which was in turn swallowed by Acer in 2007. The three brands recently unveiled more than 20 new netbooks, notebooks, and all-in-one PCs that will go on sale over the next few months.